Six Guards may be charged in Iraq massacre, but critics fear the company's 'reckless behavior' will continue. 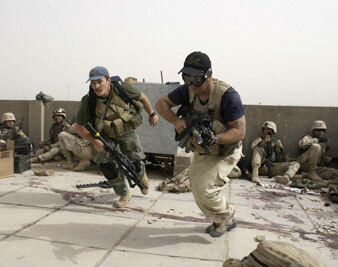 Plainclothes contractors working for Blackwater USA take part in a firefight, April 2004. After more than five years of rampant violence and misconduct carried out by the massive army of private corporate contractors in Iraq–actions that have gone totally unpunished under any system of law–the US Justice Department appears to be on the verge of handing down the first indictments against armed private forces for crimes committed in Iraq. The reported targets of the “draft” indictments: six Blackwater operatives involved in the September 16, 2007, killing of seventeen Iraqi civilians in Baghdad’s Nisour Square. The Associated Press reports, “The draft is being reviewed by senior Justice Department officials but no charging decisions have been made. A decision is not expected until at least later this month.” The AP, citing sources close to the case, reports that the department has not determined if the Blackwater operatives would be charged with manslaughter or assault. Simply drafting the indictments does not mean that the Blackwater forces are certain to face charges. The department could indict as few as three of the operatives, who potentially face sentences of five to twenty years, depending on the charges. If the Justice Department pursues a criminal prosecution, it would be the first time armed private contractors from the United States face justice. News of potential indictments over the Nisour Square shootings comes as the State Department is reportedly preparing to hit Blackwater with a multimillion-dollar fine for allegedly shipping as many as 900 automatic weapons to Iraq without the required permits. Some of the guns may have made their way to the black market. Blackwater has served as the official bodyguard service for senior US occupation officials since August 2003, when the company was awarded a $27 million no-bid contract to guard L. Paul Bremer, the original head of the Coalition Provisional Authority. To date, the company has raked in more than $1 billion in “security” contracts under its arrangement with the State Department. Despite widespread accusations of killings of civilians and other crimes, not a single armed contractor from Blackwater–or from any other armed war corporation–has faced charges under any legal system. Instead, they have operated in a climate where immunity and impunity have gone hand in hand. At present, private contractors–most of them unarmed–outnumber US troops in Iraq by roughly 50,000 personnel. There is no doubt that the Bush administration will continue enthusiastically to use armed private forces until the second Bush leaves office. This means that the future of Blackwater and the hundreds of for-profit war corporations servicing the Iraq occupation will lay with President-elect Barack Obama. This includes Blackwater and at least 300 other companies, which have been hired by the US government for privatized armed services in Iraq to the tune of about $6 billion in taxpayer money. Obama has been a passionate critic of the war industry and is the sponsor of the leading Democratic legislation in the Senate to bring more effective regulation and oversight to it. But he has stopped short of supporting Schakowsky and Senator Bernie Sanders’s legislation seeking a ban on using Blackwater and other armed contracting companies in Iraq. One of his top foreign policy advisers told The Nation earlier this year that Obama “can’t rule out [and] won’t rule out” using these companies in Iraq. In a brief interview with Democracy Now! in February, Obama explained his position when asked about the report in The Nation. As of January 20, 2009, if Obama decides to keep Blackwater and other armed war corporations on the US payroll, these private forces would go from being Bush’s mercenaries in Iraq to Obama’s. As commander in chief, he would be responsible for their crimes. As for the accountability issue, many critics allege that the most serious problems in holding contractors responsible for their crimes stem from the Bush administration’s covering-up of their misconduct and immunizing them from prosecution, and the total lack of political will to bring them to justice. When Obama appoints a new attorney general, there will be more than five years’ worth of crimes to investigate–and prosecute.